In this 2016 file photo, customers lined up at the Trillium Brewery and Taproom in Canton. Trillium Brewing, the darling of Boston’s booming craft beer scene, is facing an intense backlash online over labor practices that some current and former employees say are beyond the pale. In online forums and on social media, current and former employees said the wildly successful brewery forced many retail workers to reapply for their jobs and then offered several employees identical positions billed as promotions but paying greatly reduced rates — from $8 an hour to $5 — even as their tips plummeted. While current and former employees who spoke to the Globe expressed affection for their time at Trillium, they said the decrease in pay has taken a toll. He said the pay cuts affected a handful of longtime retail employees who had been hired at Trillium’s previous standard hourly rate for tipped employees of $8. The brewery dropped the rate to $5 an hour for new tipped employees as their workforce increased in recent years to include a popular beer garden on the Rose Kennedy Greenway in Boston, a new restaurant and brewery in Fort Point, and plans for a farm brewery in Connecticut. 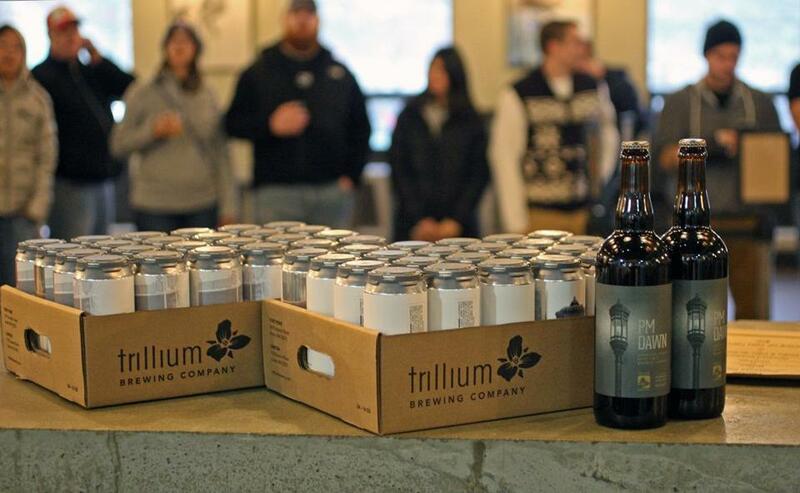 Most of Trillium’s approximately 250 employees work out of its large production facility and taproom in Canton. About two-thirds of Trillium employees are full time and eligible for health care, 401(k) matching, and other benefits. The state minimum wage for tipped workers is $3.75 an hour. Of the tipped employees given the pay cut, Tetreault said, only two remained. He declined to say whether their pay would be restored, adding that he planned to meet with them next week. The controversy originally came to a head Tuesday night on BeerAdvocate.com, a Boston-founded website and publisher where beer aficionados trade notes (and sometimes barbs) about their favorite brews and breweries. There, self-described former employees accused the brewery of cutting wages even as the business grew. In interviews with the Globe, the current and former employees said the pay cuts coincided with a move to the new location in the Fort Point neighborhood. Almost immediately, the new facility on Thompson Place was overrun by customers thirsty for the brewery’s array of offerings — intensely hoppy India pale ales, tart sour ales, and decadent stouts. But even as the crowds packed the site, the current employee said, tips at the new location dropped, as customers were reluctant to tip at the retail counter after also tipping a bartender or server. For many customers, tipping on a simple retail transaction — I give you money, you give me a case of beer — felt a bit like tipping the guy behind the counter at the package store. That the workers slinging cans from behind the retail counter are paid as tipped employees not subject to the typical state minimum wage came as a surprise to many customers, the employee said. Before he was an employee, he was a customer. One former employee, in an interview, said a similar pay cut was enacted for workers who staffed Trillium’s beer garden, but because the workers there functioned more like bartenders, the tips more than made up for the pay cut. Online, the backlash took several forms. A Facebook post advertising a new beer on offer Wednesday — Permutation 68, an ale brewed with strawberries, vanilla, and lactose for $22.20 for four 16-ounce cans — was overrun with snarky comments about the controversy. “Maybe some of that can go towards raising your employees extremely low base pay,” one commenter wrote. Some said they would stop patronizing the brewery entirely.